In recent years, companies have shown the benefits of “copying” and sending traffic from network backbones to purpose-built monitoring devices…no interference with the existing, “live” traffic and the traffic can be analyzed in real-time or stored for later playback. However, the best approaches to “copying” and sending the traffic to be monitored has been a source of contention. As 40/100G becomes more prevalent, how the traffic is accessed will become increasingly important. As virtualization and cloud applications become more and more prevalent in Data Centers, POPs, Head-ends, and Central Offices, the available rack space needed to house the equipment for these applications is shrinking. While the space needed to store, process, route, or switch the data becomes more compact, one thing that remains difficult to reduce is the physical layer infrastructure. As traffic enters or exits a facility, most providers want the capability to monitor what is being delivered or sent to/from their site. At the larger sites, this data traffic is riding on fiber, and in many cases, there are a number of fibers coming into or out of a given site. 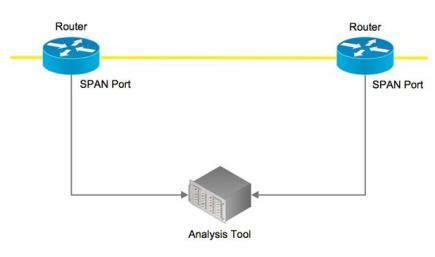 To be able to accurately monitor this traffic, a passive optical tap is used to duplicate the traffic and send it to a monitoring device that can analyze the header information native to the traffic type. In the past, these optical taps were relatively expensive and bulky. Even today, most vendors cannot provide more than 24 taps in a single 1RU footprint.